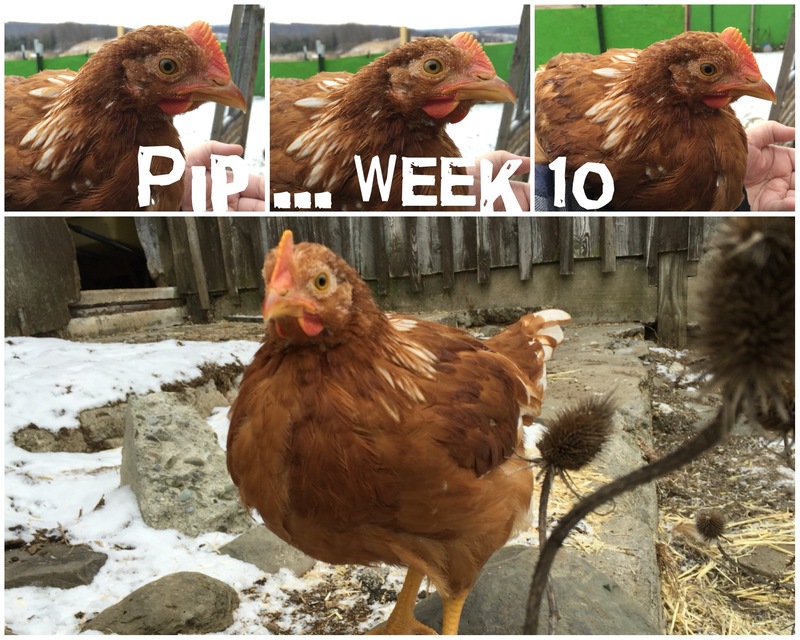 Well, Saturday Pip reached the 10 week mark. Seriously looking more like a pretty little hen than the baby roo she/he looked like back in week 4. The pics are from Saturday. As you can tell, we had some snow in the a.m. but by the time afternoon rolled around it was gone. This really has been a mild winter, which is somewhat disheartening because I was hoping the snow would be a deterrent strong enough to keep them from venturing near the road. Since we can’t build the fence for the pasture until the spring thaw, they really needed the deterrent. In the last 2 weeks, we’ve lost two more hens to the road. One, Madison (aka Pip’s bio-mom, who laid the egg) was totally splattered by a man in a minivan. He was so sorry, and came to the house to tell us and apologize. Yesterday, Dottie (one of the ones my son liked) got clipped by a trucker, who stopped and came to the house to ask if we wanted him to help ‘finish her off’ because she was still alive, but clearly would not live. That sounds odd, but his heart was in the right place. His mother owns chickens and he was also very apologetic. Since October, I’ve lost 4 hens now. 1 to a predator, and 3 to their own inability to be afraid of the road. Spring, and my fence, cannot come soon enough. Especially since we haven’t had enough snow to speak up in my part of the world. Although, we did get some today, and supposedly its going to keep falling on and off all day. Pip was not impressed. He/she went outside the coop and run to explore and came running back freaking out. I even got this video of him/her trying to find a safe place to roost, so his toes wouldn’t be cold. Poor baby! The last thing… has anyone tried growing sprouts for their chickens in the winter? Winter is almost over for us now, but I’m wondering if little beds of sprouts wouldn’t be a good encouragement to stay on the safe side of the road? It’s the ‘greener grass’ on our side (not that there is actually green grass right now, but you know what I mean) that is attracting them. Something new and different. I think the sprouts may be a good idea to keep their interest. I attempted sprouting for my chickens last winter, but we had too much going on and I didn’t really have room to do it correctly – I was sprouting in tupperware containers on my kitchen counter. I gave up trying to grow them and just gave the chickens what was there. They ate some of them. I think it depends on what you’re sprouting. I was just sprouting some old “sprouting seeds” for people to eat. If you had stuff chickens tend to love, like some chicken fodder (you can buy “chicken fodder” seeds) they may be more into it. Is there any way you can put up like some boards or something to deter them until you can get your fence up? I’m thinking something they would have to jump over – some chickens may cross it but the lazy ones wouldn’t. You may have already thought of something like that though, or the area they can access the road may be too large to do that. I hope you don’t lose any more. I could lock them in the run, but they have picked the run clean of all vegetation, so I don’t like using it unless we’re going away and plan to be gone all day. Plus, the determined ones can still fly over the top (it’s not enclosed. DH wouldn’t do that) if they wish to, even with their wings clipped. There’s four of them who do it all the time. Oh No! 😦 Sorry to hear about your losses. We’ve had constant snow here since December so our ladies aren’t venturing out very far or for very long. I do use a wire coat hanger and slice up oranges and string them on that along with grapes and other things and hang it in their coop to keep them occupied. I hang it in the morning and by the time I get home from work the oranges are all pecked down to the rhine. I have not tried sprouts though. Maybe some hanging treats near their coop or away from the road would help keep them put until the fence can go in.